Crystal feminized cannabis seeds do live up to their name, if you want crystals, that's what you'll get! A real Winner of the Dutch Highlife cup 2002. Crystal is a crossing between a strong Northern Light and White Widow and that gets very clear as soon as you see her grow. Looks a lot like White Widow but has the strong properties of the Northern Light with mold and illness resistance. She isn't a tall grower and grows into a healthy plant and she is a perfect mixture between sativa and Indica. Well developed buds grow thick and full of resin and have that lovable fluffy look that promises you great taste as well as effect. 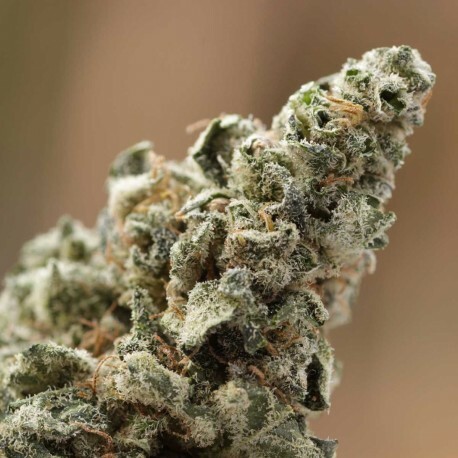 Crystal has a lovely sweet smell that also emerges when you smoke it, the crystals won't disappoint you and take you into a relaxed creative all over buzz without any signs of a couch-lock. It is pleasant to smoke because of the softness in your throat. Crystal feminized seeds have been winner of various prestigious cannabis cups over the last 10 years and the whole marijuana world really loves this exotic strain. Crystal feminized seeds are Northern Lights crossed with White Widow. Though they make short plants, they are bushy with sticky buds that are loaded with loads of crystals, and hence the name. They are not only very high in THC levels, but also one of the high yielding marijuana strains available in the market. What makes it more appealing is that it is easier to grow when compared to White Widow, which makes it as popular with beginners as it is with seasoned cannabis growers. The smoke produced gives a real kick and its typical kerosene like scent is like an icing on the cake. On the outside, they look more like White Widow for obvious reasons but they also have very strong characteristics of Northern Light, making them mold resistant. These seeds are a perfect mix of Indica and Sativa bringing in the best of both worlds. The fully grown buds are fluffy and thick. These resin-filled buds promise amazing effect along with a great taste. The sweet smell is evident the moment you start using it. The crystals on these plants don’t disappoint you at all and give you an energetic, relaxed but creative high without turning you into a couch potato! It also comes very soft on your throat, which makes it all the more enjoyable. Its THC content ranges between 15% to 20% and you can expect flowers within 8 to 9 weeks. September is the best time for harvesting Crystal feminized. It easily gives you 400 gm of dried weed for each square meter. Crystal feminized seeds bought at High-Supplies further assure you of world class quality at unmatched prices, so go ahead and give them a try today! Posso efetuar o pagamento por boleto ? É para o Brasil da para enviar bem disfarçado? 4 graines sur 5 ont germé , elles poussent correctement mais elles prennent un peu plus leur temps que d'autres variétés. It is correctly mentioned in the website that Crystal Seeds can get germinated too fast. I got it germinated in just 2 months, this is too quick. For growing the plant, I kept them under small tent with 110 watts. When I plant them it was just 16 cms and after it grown it became 75 cm. So, beware guys this is super-fast to grow. What do you mean by fluffy, is it soft buds. With the “crystal” seeds grown outdoors approximately when will they finish. Yes, here in Holland it is legal to order. hey emmy . What is gorilla weed ? Outdoor its problem this product?